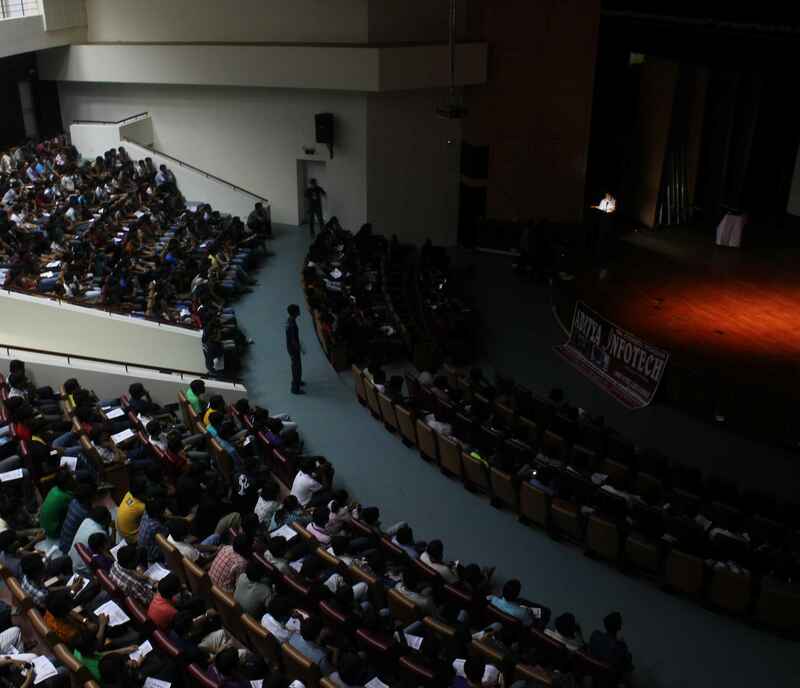 As with every year, Technology Robotix Society arranged for a grand welcome to the new students of IIT Kharagpur through the introductory workshop held at Kalidas Auditorium on Wednesday, the 25thof July. And what a welcome it was! The auditorium, one of the largest in thecampus, was filled to overflowing with eager freshmen curious to know what thissociety was all about. We are sure that all their questions would be answeredby the time we were done. It started off with an introduction to the societyand what we do every year. The students got to know about our workshops allacross the country, our in-house events, the projects we had helped to build,and of course, our technological extravaganza ROBOTIX held each January. Therewere some excellent videos and pictorials showcasing the robotics scene in Kharagpur in all its glory. It was heartening to see the interest that theaudience was taking. After that introduction, we moved to a slightlymore technical area, i.e. to knowing more about robotics. Aware of the factthat most of the people in the crowd did not have much of an idea about robotsother than what they had observed in popular fiction, we gave a presentationthat assumed zero prior knowledge and started right from scratch. The studentsexplored what the different parts of a robot and types of robots were, andtheir applications in various fields. Along with all of this, there were alsointeresting trivia questions for the spectators, with nice goodies for thosewho got them correct. One of the highlights of the show was a demonstrationusing the very powerful Microsoft Kinect, and a few volunteers from theaudience dancing on stage while playing an interactive game, with the Kinectsensing and mapping their movements. This was followed by more demonstrationsof actual robots made in Kharagpur. There was a robot that could clasp a zip-lineand move along it, a very accurate line follower, and an image processing robotwhich could follow a coloured ball as it moved around. Once the audience had seen enough of actualrobotics to whet their appetite for learning more about it, we gave them alittle taste of the kind of work they would actually be doing very soon as theymade their first foray into the mad world of robots. There was a briefintroduction to the basics of both manual and autonomous robotics, and anoutline of what all was required to be learnt and implemented to actually makeworking robots. With that it was time to close the curtains onwhat had been a very enlightening and exciting introductory workshop. Theaudience was left asking for more and many of them stayed behind to interactwith and ask questions to Team Robotix. We were happy to answer all of theirqueries and happier that so many were so interested in what we had shown them.It truly was a vindication of the effort and hard work we had put in to makingthe show a grand success.